Mass surveillance, weddings, and ambivalence: The week's most interesting Slate stories. Director of National Intelligence James Clapper testifies before the Senate Armed Services Committee in April. “The Case for Mass Surveillance: The NSA’s database of phone calls makes sense. But it needs clear safeguards to prevent abuse,” by William Saletan. 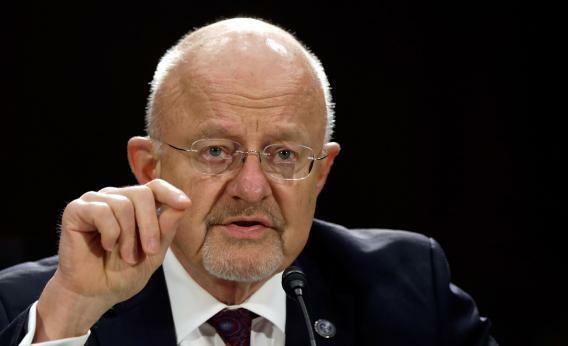 President Obama and James Clapper claim that our phone information is safe with the NSA, citing safeguards like “congressional oversight and judicial veto power” as limits to data abuse. Saletan argues that while that’s all well and good, these procedures need to be revealed to the public or “we won’t let it have the data to begin with.” Elsewhere in Slate, Saletan criticizes Obama’s consistently vague answers to the public’s questions and Fred Kaplan argues that we should just fire James Clapper. “What Is Anthony Kennedy Thinking? : Why the Supreme Court justice might decide we’ve been thinking about gay marriage all wrong,” by Sonja West. As the public awaits the Supreme Court decision on gay marriage bans, all eyes are on Justice Anthony Kennedy, who has been the swing vote on issues such as the death penalty and whether terrorists should be tried in civilian courts. West explains that, instead of entering uncharted legal territory and confronting discrimination based on sexual orientation, Justice Kennedy could choose to play it safe by framing the debate in terms of gender discrimination. “A Presidential Tease: Hillary Clinton joined Twitter and winked at the speculation she may run in 2016. Too soon,” by John Dickerson. The former secretary of state debuted her Twitter bio Monday, using the meme-tastic photo of her on a military transport flight for her Twitter avatar. Her cheeky bio includes such accolades as “pantsuit aficionado,” and “glass ceiling cracker,” and concludes with the mysterious “TBD…,” hinting at a 2016 presidential run. Dickerson thinks it’s too soon for her to begin the “will-she-or-won’t-she” game, and argues that if Twitter is to be an effective tool for Clinton, she’ll need to break from the PR-conscious chaos that Twitter currently is and find a way to continue the authenticity she revealed in her first tweet. “The Wedding Industry’s Pricey Little Secret: That widely used ‘average wedding cost’ figure is grossly misleading. Here’s a much more accurate number,” by Will Oremus. Ask Google how much the average wedding costs, and it will almost always tell you the same answer: between $27,000 and $28,000. Oremus explains that number is both wrong and misleading, pointing out that it results fromselection bias and the crucial difference between median and mean. And check out the rest of Slate’s wedding coverage, including Matthew Yglesias on why we should stop buying wedding presents and buy graduation presents instead. “Why One Child Is Enough for Me—and Might Be for You: A smaller family means all of the joy, less of the crap,” by Lauren Sandler. In this excerpt from her new book, One and Only, Sandler makes the case for having just one child. Sandler, both an only child herself and the parent of an only child, cites research that suggests that parents of just one kid are happier and more satisfied with their lives than parents with multiple kids. In the age of overparenting, Sandler argues, it’s easier for mothers and fathers to lose themselves when they’re caring for more than one child. “Great Airplane Reads: Not too scary. Not too slow. Totally absorbing. The criteria for a perfect airplane book,” by Katie Roiphe. What should you read during your next plane ride? Not a trashy novel. Roiphe suggests a few “truly, effectively transporting” books that can speed up long hours aboard an airplane—or quell the fears of sudden turbulence. “Ambivalence Is Awesome: Or is it awful? Sometimes it’s best to have conflicted feelings,” by Ian Leslie. Feeling conflicted about your opinion on Edward Snowden? That’s OK, says Leslie. Ambivalent people, those with an “excess of opinion,” are quite normal, and emotional ambivalence can reflect maturity. “Man of Steel: Can America stomach a superhero this saintly?” by Dana Stevens. In a review of the new, highly anticipated Superman film, Stevens praises Zack Snyder’s inventive world-building but laments that this “elegantly illuminated retelling of [Superman’s] origin story” forces viewers to wade through more than an hour of—admittedly stunning—Krypton footage before meeting young hero Clark Kent. Elsewhere in Slate, Kyle Hill (finally!) explains the science behind Clark Kent’s ever-impenetrable disguise.